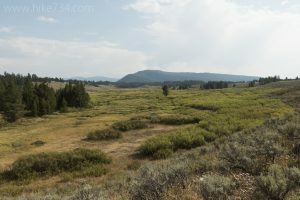 This short loop has a nice variety of habitats with willow lined creeks, a pond, dry forests and sagebrush meadows. Continue up into the forest where another trail junction is reached. Take a left and head east toward Lookout Rock through a mix of forest and meadows. Head north by taking a left at the next trail junction (or head straight at this junction for 0.3mi/0.5km to Lookout Rock, a wonderful overlook of Emma Matilda Lake). As the trail meanders northward, it alternates between tree-lined meadows and the forests that surround them for 0.9mi/1.4km to another junction. Take a left through more of the airy forest before the trail drops to a riparian area, then up along a moraine. The trail now parallels the road with views across to Christian Pond and surrounding wetlands. It works its way south to the first junction where you turn right and head back to the corrals. Trailhead: Take the road to Jackson Lake Lodge and make a left at the first junction, then another left to the gas station. Park in the parking lot on the right near the corrals and find the trailhead at the east end. An alternative trailhead begins at a small turnout on the east side of the highway, just north of the bridge near the turnoff for Jackson Lake Lodge.